There are few more questions on the after math. The FIR was written in Urdu script and Persian language. One of the witness of Gandhi murder walked to the police station and gave a statement that Gandhi was killed by Revolver shots precisely 3 shots. 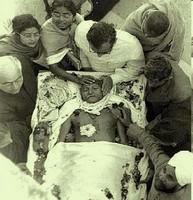 Now immediately after death of Gandhiji there was lot of commotion. No doctors were there no postmartum done ? How can a civilian in the crowd not close to Gandhi gives testimony that 3 bullets fired ? The police sent him back to Birla house and prepared the FIR in Persian and Urdu script and came to Birla house and rather than himself finding what happened spent next few hours finding the complainant and he read the statement to the complainant and asked him if it is true. The complainant said it was true and signed the document. Gandhijiwho dedicated himself for Social Justice, Gandhiji and Gandhiesm himself suffered injustice in real.